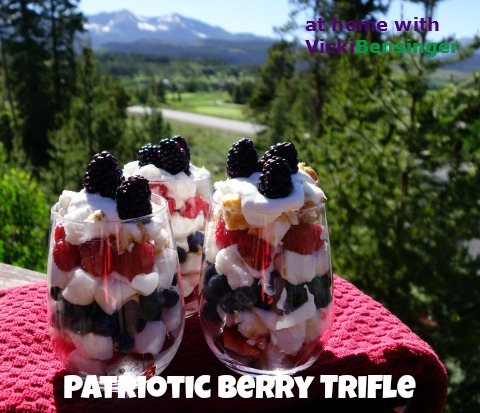 My No-Bake Berry Tart whips up in no time. What I love most – I don’t need to put it in the oven or on the stove. Just blend ingredients, layer, and refrigerate. 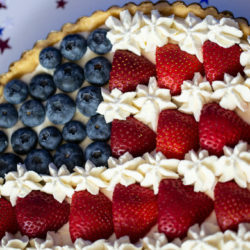 I got the idea for this particular tart from my Fresh Fruit Tart. For that tart I baked the crust. 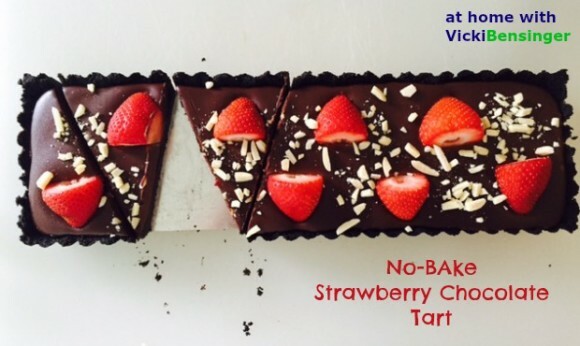 Then I remembered the No-Bake Strawberry Chocolate Tart I made in 2015. I loved that Oreo crust and of course the smooth rich chocolate piled with fresh berries. Having made the crust with Oreo’s I decided to try this Berry Tart with a white Oreo crust. My intent was to use plain white Oreo’s, but when I saw the Lemon Oreo’s I figured why not! If you’re not a fan of lemon though then just use the vanilla or one of the many new varieties – Piña Colada sounded pretty tasty too! Once you try this recipe feel free to adapt it any way you desire. I know you’re going to love this and will find it your go to dessert, time after time! 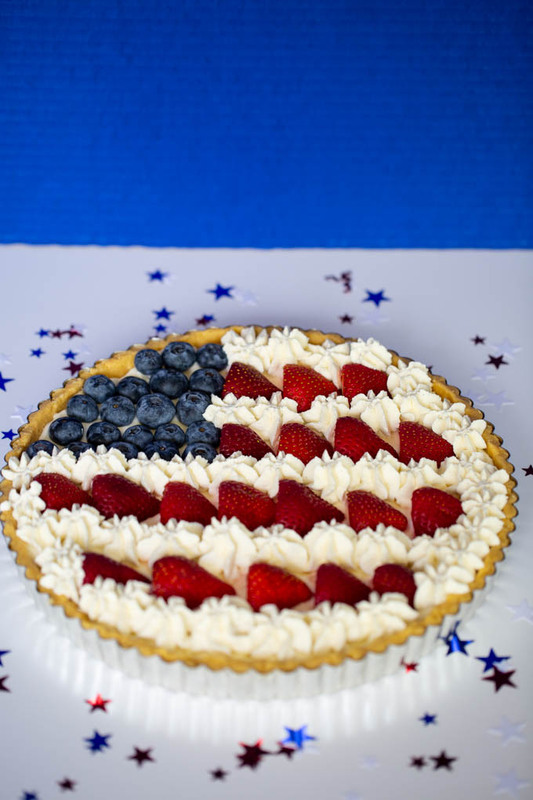 My simple No-Bake Berry Tart for Independence Day couldn't be easier. Try it, you'll love it! Crust - Place Oreo cookies into the bowl of a food processor and blend until crumbs form. Add melted butter and pour over the crushed cookies. Process until evenly moistened. Press cookie mixture with the back of the spoon and your fingers where necessary, into the bottom and edges of a 10-inch round tart pan with removable bottom. 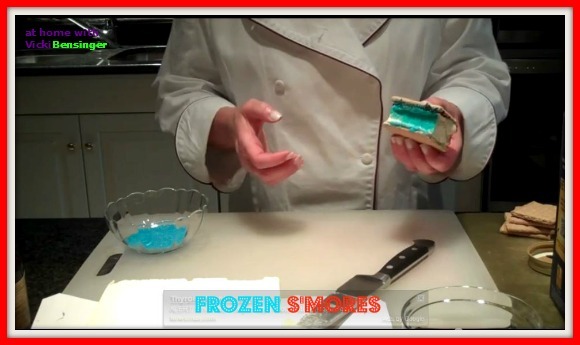 Place in freezer while you prepare the filling, about 5-10 minutes. 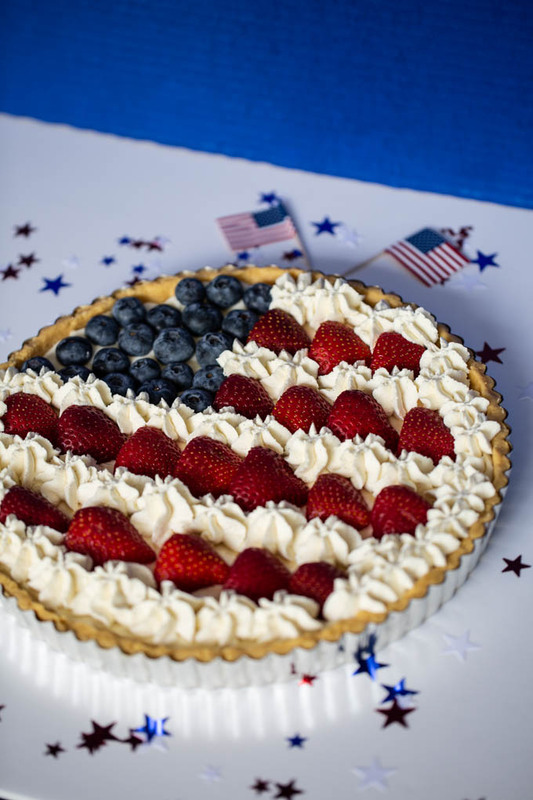 Topping – Lay sliced strawberries on the filling, in a straight line across, as shown in the photo leaving room at the top for the blueberries (stars). Repeat with the strawberries leaving about a 1-inch space between each row. Fill in the square with fresh blueberries. Optional: Take 1 teaspoon of Apple Jelly and heat in the microwave for about 15-20 seconds. Remove, stir and add a touch of water to thin the jelly. With a pastry brush, gently dab a thin layer of the jelly over the fruit to create a glaze be careful not to get on the whipped cream. Refrigerate until ready to serve. Note: This recipe can be adapted any way you like. Use whatever fruits you desire, oreos, and tart pan, whether round, rectangular, heart-shaped, etc. 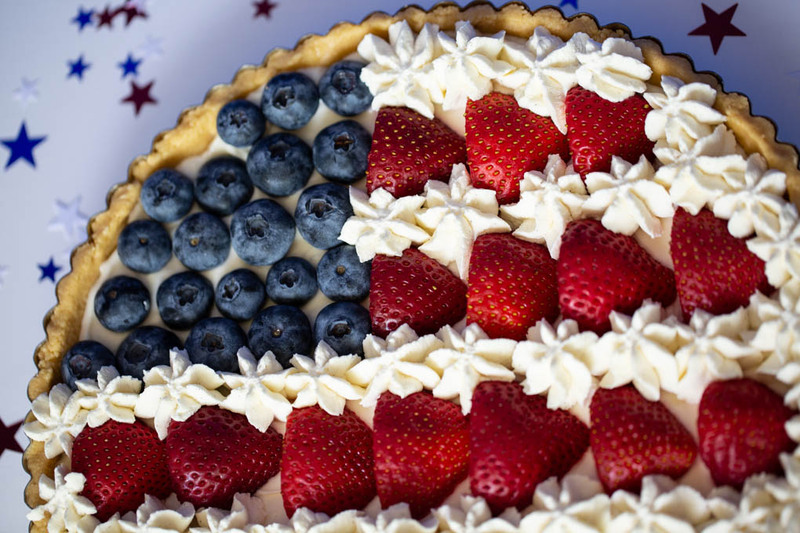 Very summery and delicious with all the berries and creamy filling! Thanks Angie. I think you could easily recreate this to be gluten free so you can enjoy it as well. SO pretty and festive! 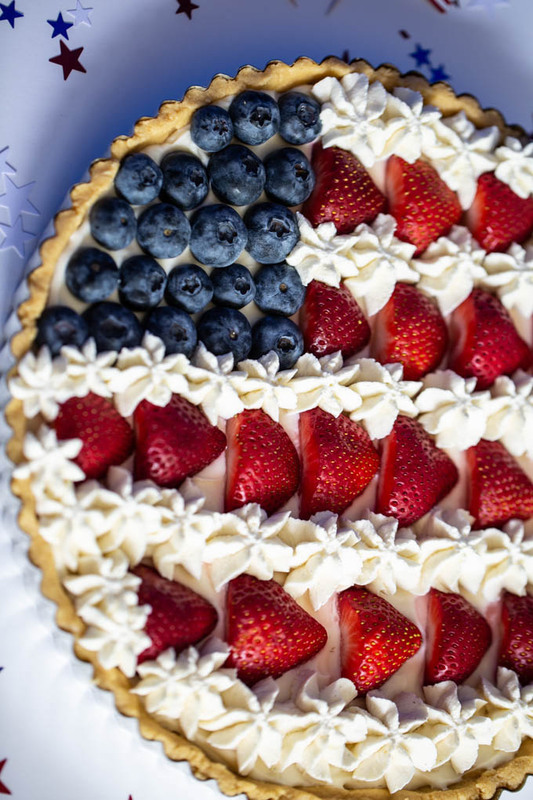 And no-bake is perfect for a summer dessert! Pretty! Love all the fruit — this must have terrific flavor. And with the 4th next week, perfect timing! 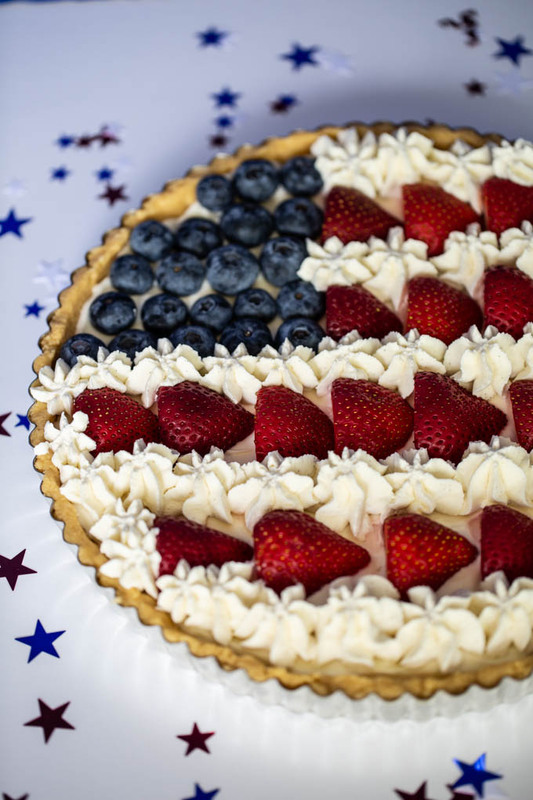 Love that it’s so simple, fresh and that the whole tart is no bake.Happy 4th!